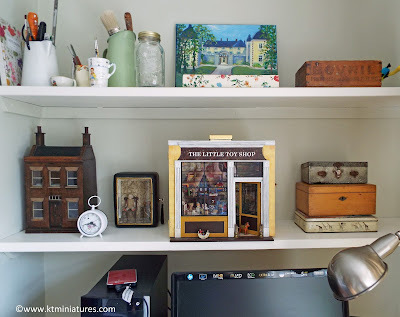 So many wonderful miniature treasures have passed through these KT Miniatures doors over the years, and then sometimes something comes in that baffles me. On this occasion it was some pin and thread furniture. 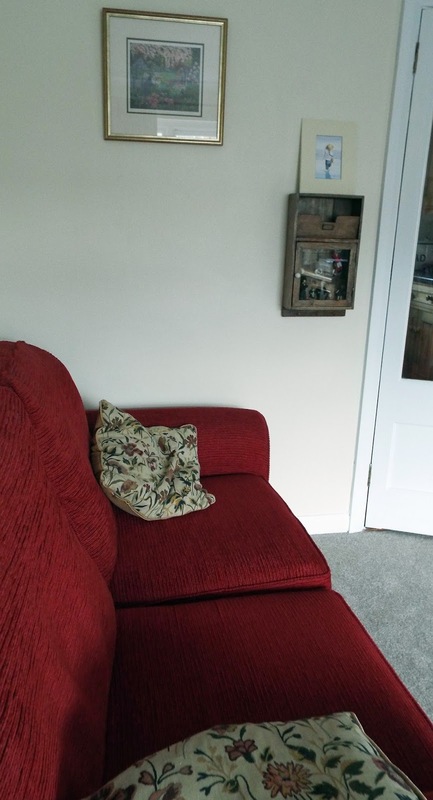 I have seen various forms of this kind of furniture before, often so very obviously homemade and from various decades...even as late as the 1960s. And it is when these items come in quite randomly, with no provenance or exact date, then I have to try and figure out their age. 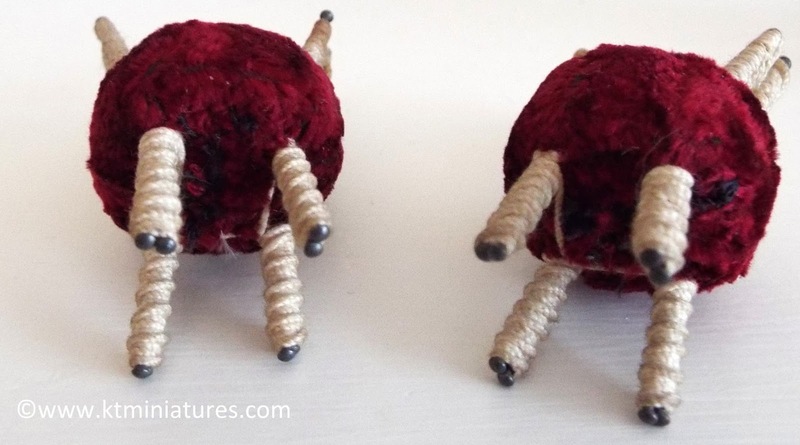 Each piece of this particular set has been constructed from using heavy dressmaking pins and strong thread, plus red velvet for upholstery. 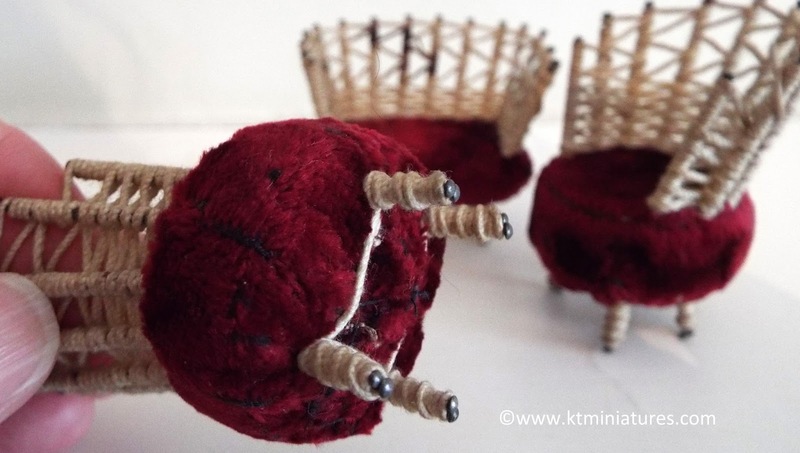 The thread has been woven very intricately and delicately around the pins to create the framework. The legs and chair backs have been bound tightly with the thread. They are quite small in scale - the table measures 3 1/4″ in diameter x 1 1/4″ high, and each chair measures 1 1/8″ sitting height x 2 1/4″ back height. and then a lovely lady emailed me, to shed some light on their age! 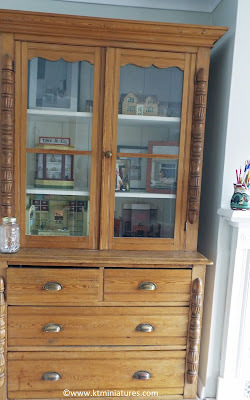 She told me that her mother-in-law had been given an exact same set of this furniture when she was a little girl, although hers had a green/blue velvet upholstery but that the lacing and everthing else was identical. The little sofa measures 2″ wide x 7/8″ sitting height x 1 3/4″ back height. Each chair measures 1 3/8″ wide x 1″ sitting height x 2 1/4″ back height. 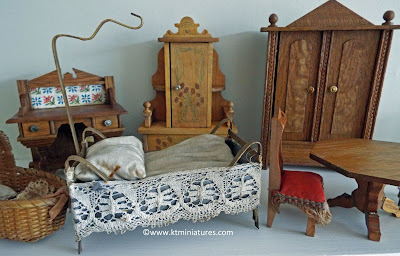 The lady then went on to say that her mother-in-law was born in 1909, and being a Methodist minister's daughter, money had been very tight, hence the little furniture had been very special to her. So very fascinating indeed. This furniture is a lot older than we first thought, maybe pre WW1 or during WW1! 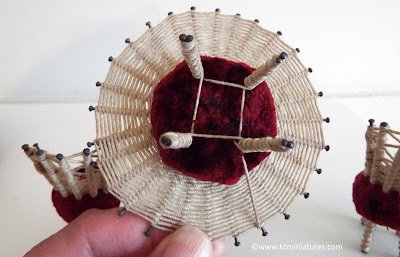 Since I learnt this, I discovered some other furniture exactly like this, so I am now firmly of the conclusion that these were most definitely commercially produced and not homemade ...I never stop learning about these old treasures! But it is often thanks to other people who so very kindly take the time to email me their information. If you are off to Jersey for your holidays in a couple of weeks time or if indeed you live in Jersey, then how about nipping down to the bi-annual Jersey Dolls House Club's exhibition on Saturday 12th August, and help them raise money for two of their local Jersey charities - Autism Jersey and SCBU (a charity for premature babies). This wonderful exhibition is being held at St. Brelade Parish Hall in St. Aubin, Jersey. It will be open from 10am until 5pm, entrance fee will be £2.00 - children entry free. 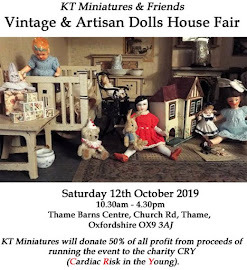 The exhibition is always a fun day with lots of lovely miniatures to feast your eyes on, including a display of members own handmade miniatures and dolls houses, a sales table of miniature items made by members and a raffle - the first prize being a kitchen designed by Susan Deans (the club secretary). 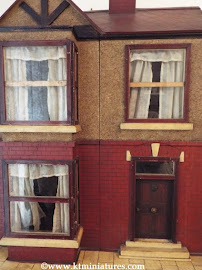 This year the theme for members miniature room box creations is "Inside Out" and these will be on display too. 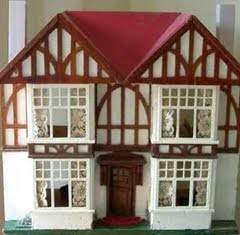 There will also be refreshments and a dolls house for children to play with. The photos above are of Odette Gardner's childhood house, which will be one of the exhibits on the day. It is genuine Jersey, just as Odette is! It was given to her by her godparents in 1954 when she was 7 years old. All the furniture and accessories in the living room were made by Odette and represent her childhood home. Many thanks to Jersey Club member, Barbara Kendall-Davies, who sent the above information and photos. I wish the club all the best and hope that they have a fabulous day. 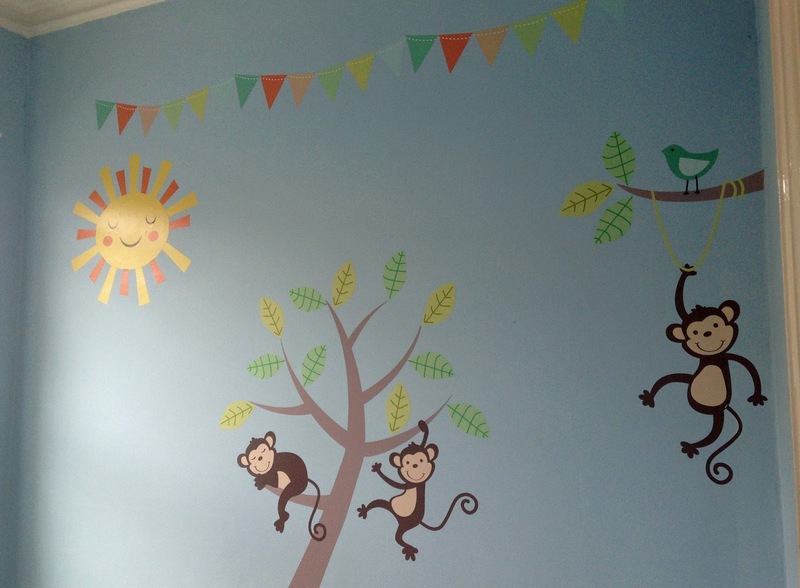 So when it was suggested that I went up to Liverpool last weekend and help decorate the nursery, how could I refuse. I say decorate, well actually the room had already been painted a pretty blue and a brand new carpet laid. It was just a simple task of fixing transfers that the baby's mum had bought online (from "Not On The High Street") and stick them on the wall where she wanted them to go. Easy peasy and great fun! We started off with the tree trunk and then created the branches. 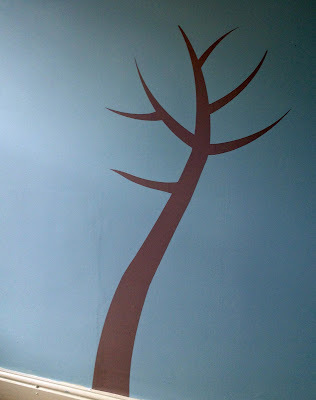 It was far simpler than I thought it would be, the transfers are self adhesive and relatively quick to put up. Although it is definitely a two person job for some of the larger sections as they have a habit of sticking to anything in sight! 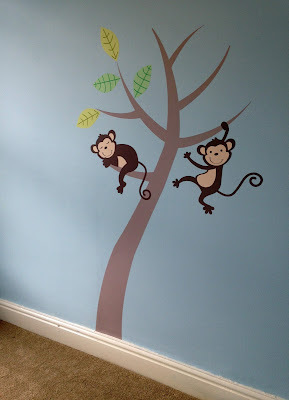 Gradually two of the monkeys were added, and then the leaves on the branches. Then another branch coming from the side of the wall with another monkey and a bird up on the corner branch. Next was a smiley sun and some colourful transfer bunting along the top and hey presto....one very cheery and lovely nursery. 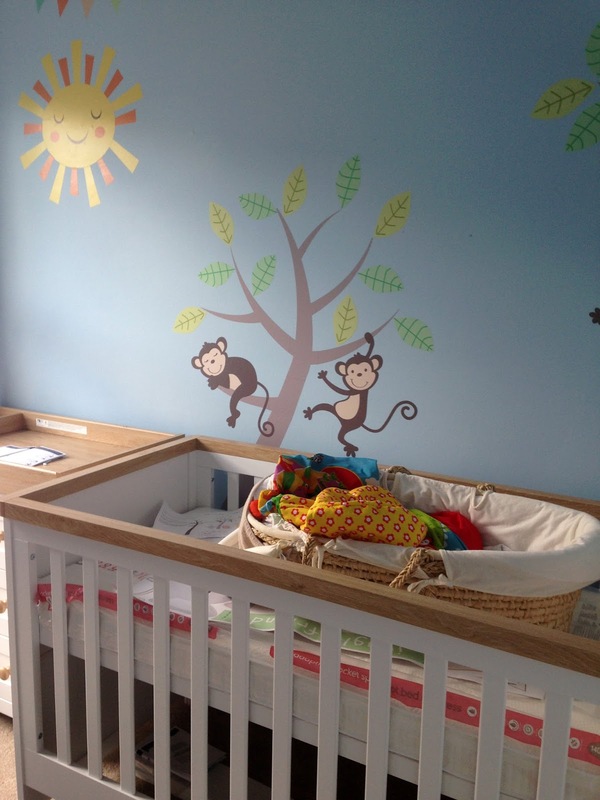 However, putting the cot and chest of drawers together were another matter and not quite so easy, it all took one heck of a long time (the completely illustrated instructions were a little vague in places)...but after much head scratching and pondering, we got there in the end. It is exactly a year to the day that lovely Mr KT (aka Dave) passed away during his much longed for liver transplant operation. The first few weeks after his passing I felt as though I was lost in a kind of "fog", shock mixed with raw grief I suppose. Hence it did take me a while to get going again with KT Miniatures, but...slowly and surely life began to move forward with the help of family and friends. Suddenly and very quickly (like so many others thrust into the same position), I have had to learn to deal with problems that I'd never had to before in all my 36 years of marriage. Mostly because they were Dave's area of expertise and he would automatically sort them. Probably to date, the most challenging have been technical problems with the computer and KT Miniatures' website, and all things to do with my car! But I am learning and have surprised myself in what I've been able to do. One of the best pieces of advice from someone given to me after the funeral was to keep busy...and I have been doing just that. Ok, occasionally grief has a nasty habit of creeping up when I least expect it but it passes, and the secret is definitely not to sit and mope, but to get out there and do something. And although it hurts like mad that he missed his daughter's graduation ceremony last autumn, that he missed a son's wedding this January and was not here to share in the pure joy of our first grandchild recently born or indeed the impending birth of a second grandchild soon to be born...life does feel so much better now. 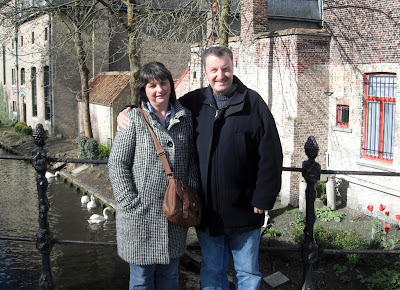 Dave was naturally a very positive and optimistic person right up to the very end, he used humour to help him and me cope with his prolonged illness, even in his darkest hours. What is rather nice is that we as a family can smile or chuckle when we talk about him now. Thanks once again to everyone for your kindness and friendship given over these past few surreal months and for your continued support to KT Miniatures. New Studio Finished At Last - Time To Move Back In! 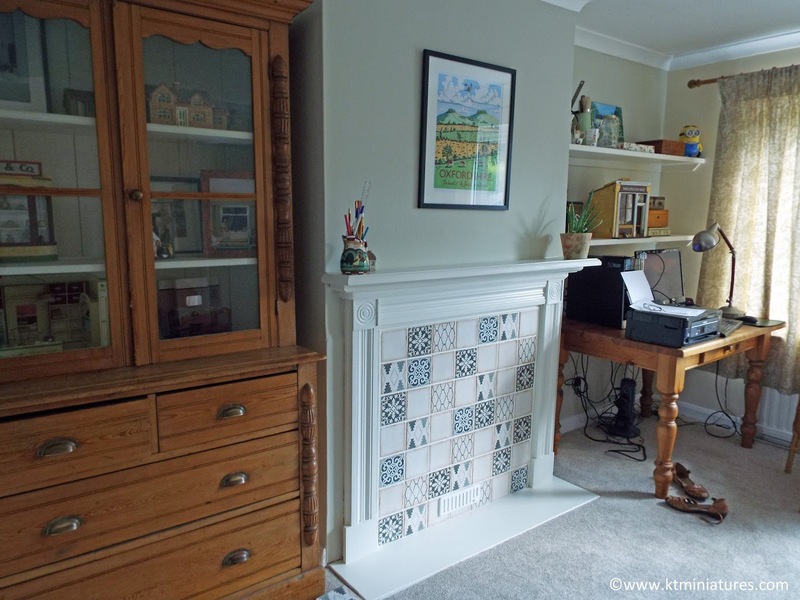 At last, after several weeks of upheaval and hard graft, my new studio/workroom is complete. The carpet is down, the furniture is back in and although I'm still in the process of moving "stuff" down the two flights of stairs from my old workroom, I can now get back to work properly. As you can see, I decided in the end to paint the pine fireplace and the wooden alcove shelves in an off white eggshell paint. 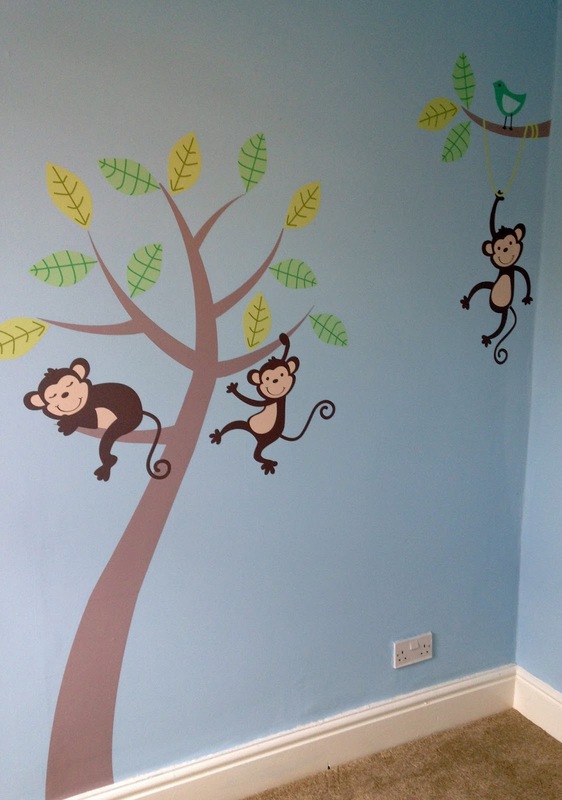 But I'm confident now that it was the right choice and it has really enhanced the room. I used a selection of vintage style tiles from Topps Tiles and created a random effect of five different designs from the same tile range. The result was even better than I thought it would be. 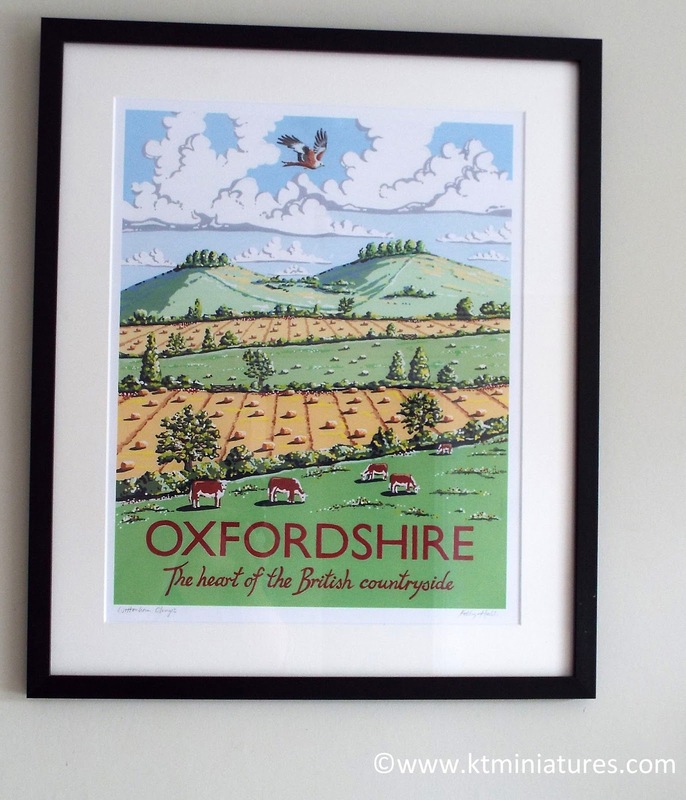 The poster was from Kelly Hall Designs bought a while ago and I finally had it framed by a local company. I absolutely love it as the artist has featured a local landmark called Wittenham Clumps for this Oxfordshire poster, which she has created in the vintage railway poster style. It really enhances the space above my fireplace. Am still in the process of moving everything down from my old workroom but gradually the room is taking shape. I use vintage jugs and nursery cups picked up from local car boot sales and charity shops to store my tools, paintbrushes etc. So too old tins, boxes and even wooden boxes are used to hold other bits and bobs. I really don't care if the jugs or cups have hairline cracks in, or the tins have dents and are a bit on the rusty side... they are perfect for what I need them for. 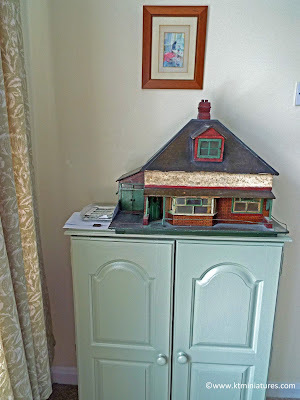 My old tiny Victorian dolls house has now been moved from the hall shelf into here, along with my old style toy shop. 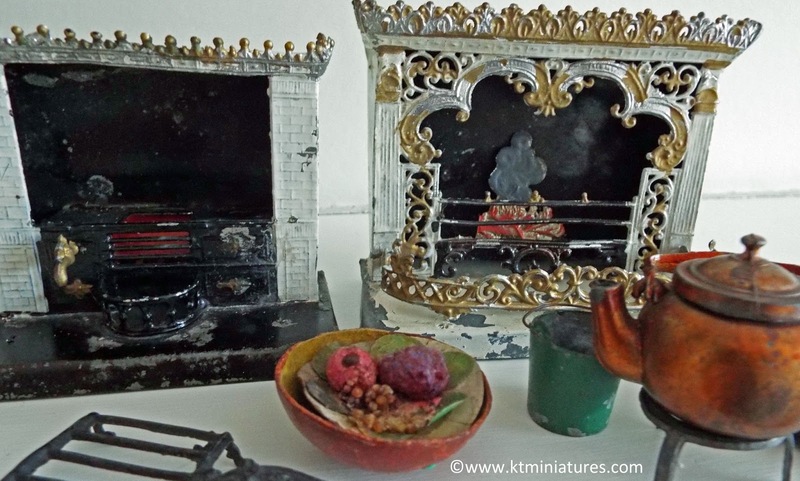 A black Victorian jewellery box, admittedly a little worse for wear, is turned up on its end and is perfect for housing three little treasures. The tiny clock was bought for just under £3.00 in the Dunelm sale - my pretty green curtains were also from the Dunelm sale at an absolute snip of a price...I do love a bargain! The lovely ancient burgundy vintage industrial style lamp belonged to daughter-in-law but she had no more use for it so it had been destined for the charity shop. However I rescued it for my desk but my goodness...it weighs an absolute ton! The beautiful painting of a French chateau on the top shelf was a very special gift from a friend. 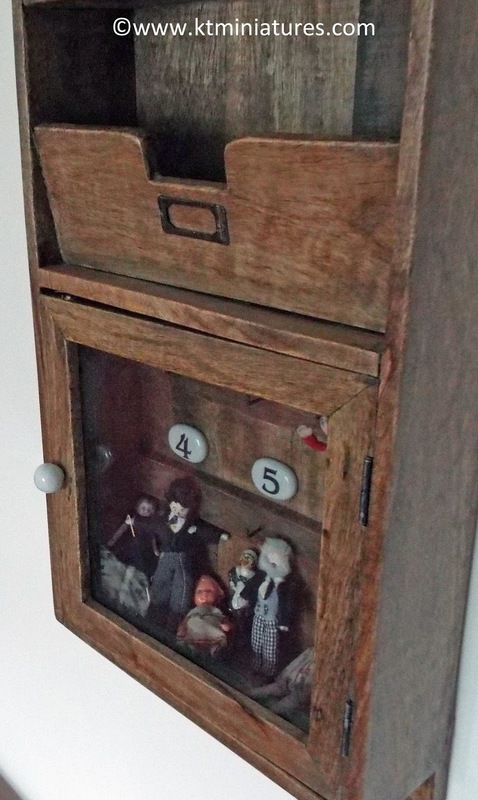 My lovely old 1920s cabinet is now very useful for keeping absolutely everything in! An old pine school cupboard has been brought down from upstairs and painted in a pale green/grey eggshell paint. I have great plans to do something arty with the doors and want to change the boring old knobs, but that will have to wait for another day. My lovely old battered 1920s/30s bungalow is now at home on the top. The cupboard itself is filled with all my paints, glues, tools, etc. My old squidgy red sofa is still on the other side of the room - it is so comfortable and I have had it for years now. You just sink into it....bliss! Another absolute bargain was this vintage key cabinet and letter rack, bought greatly reduced in a closing down sale from a wonderful local shop. 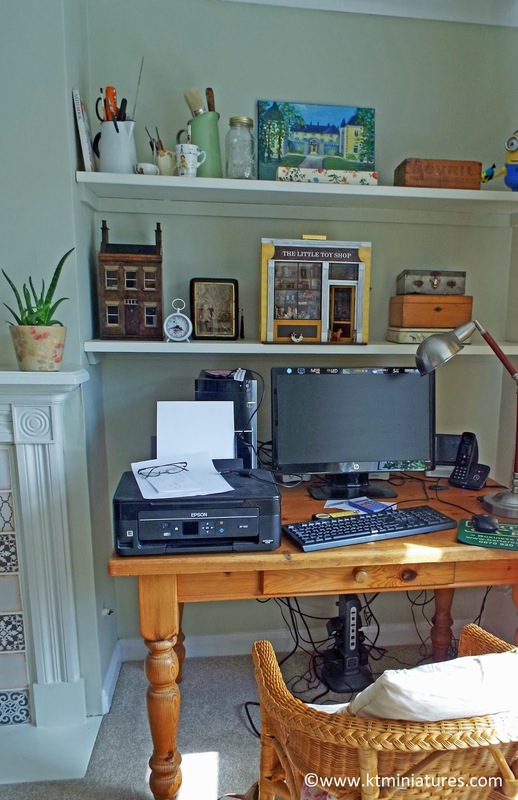 I will use the letter rack for letters but I won't be using the cabinet for keys. 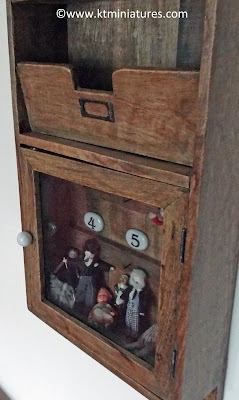 Instead I will use it to keep all those little dolls that I could not find a home for in my dolls houses for whatever reason....I had to give them somewhere nice to live, instead of a dusty box? So there we are....I still have quite a lot more to do - as yet I don't even have a lampshade. 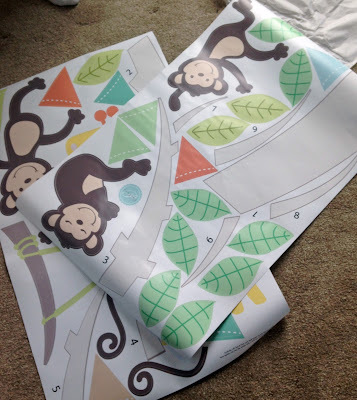 Am also looking for a massive old picture frame to make into an arty noticeboard using vintage offcuts of antique wallpaper (if I can find enough) or possibly old ephemera....but that will also have to wait for another day, as I have now blown my meagre budget completely. 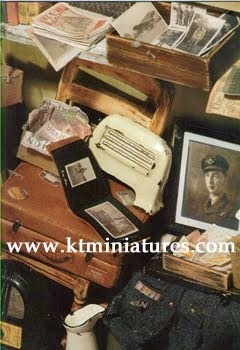 Tomorrow I hope to get stuck into some KT Miniatures work and begin listing some old treasures once again. Last week I put up the other half of a wonderful antique dolls house collection that came in recently. 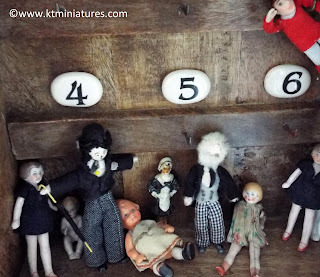 I was left gobsmacked, as within 24 hours nearly all new "antique and vintage stock" that was put up for sale on KT Miniatures' website literally flew off the shelf! Which was nice for me but there were a few disappointed customers...sorry. If only I had more but some of these just do not come along that often and in such good condition. Amongst some of the more unusual pieces was a German oak wardrobe, a curious old Art Nouveau wardrobe - very pretty, an antique metal bed with canopy pole, all of which can be seen in the photo above. Then there were further old treasures such as these two very old German tin and soft metal fireplaces. 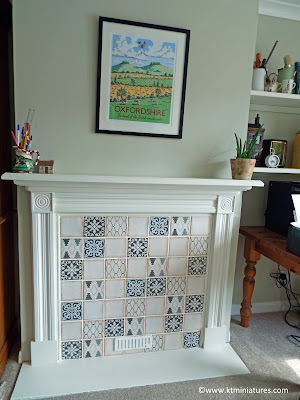 The smaller one has a built in range and the larger fireplace is ornate, and quite pretty. You can just see a hint of a glorious old metal teapot on a trivet, which I suspect is as old as the 19th century Evans & Cartwright range that it came with, and which you can see in the previous posting on here. The odd looking bowl of fruit I have never seen before and again, I think it is very old. The bowl is made of very thin wood and the mock fruit are fixed to a paper disk that has been hand decorated. My new studio is coming on nicely and I am very excited. 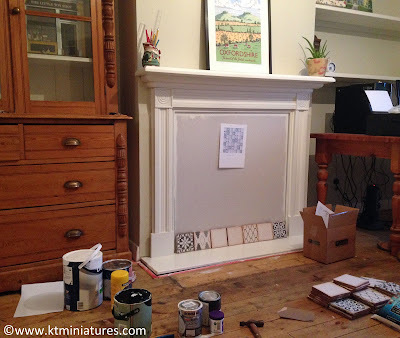 A builder friend is coming tomorrow to tile the fireplace - it is going to be tricky as some tiles need to be cut plus a vent needs to be put into the backboard...so as he is a professional and knows what he is doing, I decided to leave that job up to him. As you can see in the pic above, I decided to paint the pine fire surround in an aged white eggshell paint, so too the built in shelves over my computer desk....and am chuffed to bits with the result. I've made a random patchwork plan so that my friend will know which tile to put where (hopefully). I decided against having just floorboards for numerous reasons including that I just could not face more weeks of chaos, with sanding and varnishing etc, so the carpet is due on Wednesday. Meanwhile, sadly that is the end of that particular old collection, all have been listed and more or less sold now, but I do have some other lovely miniature treasures that have been stored away for several weeks up in my old workroom, and which will be listed to the website as soon as my new studio is up and running, and fully functional...hopefully by the end of the week.